This is the original color of the Nomad Apple Watch Modern Strap and AirPods Rugged Case. 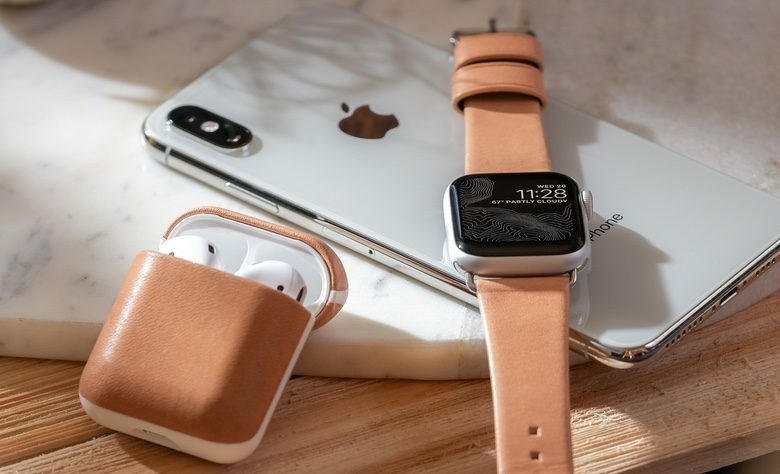 Leather is a popular choice for Apple Watch bands but the latest from Nomad takes this material in a slightly unusual direction: it’s as untreated as possible. The intent is that this light-colored band will take on a patina over time. Nomad also just introduced an AirPods case of the same material. According to Nomad, its Modern Strap Watch band is “made from minimally treated, vegetable tanned leather from one of America’s oldest tanneries. The leather is designed to patina with time, creating a beautiful, rich leather strap with a look that is uniquely yours.” The material comes from the Horween Leather Company, founded in 1905 in Chicago. The band comes with either silver or gold hardware. The price is $59.95, and the band fits only the 40mm/38mm version of the Apple Watch. Nomad’s new Rugged Case for Apple’s AirPods is also made of Horween leather so will take on the same patina. Those who don’t want that can get this item in black or rustic brown. Just to be clear, this is really a case for the case for Apple’s wireless headphones. It goes around the AirPods’ white charging case; it isn’t a replacement. Nomad charges $29.95 for its Rugged Case. It’s available now, as is the Modern Strap. This company also makes iPhone cases, including ones for Apple’s latest models.